WooCommerce, Shopify, and OpenCart are the three whales eCommerce world is held by. With more than 38 million downloads WooCommerce currently empowers more than 28% of all the online stores worldwide. The official website claims there are over live 500,000 stores on Shopify. OpenCart seems less popular? Don’t make hasty decisions. It has more than 300,000 live websites and deserves your attention. Robust functionality and advanced capabilities make these three platforms stand out. But which one should you select? WooCommerce vs Shopify vs OpenCart: which one will benefit your business the most? Match it with the specific requirements of your business. Download your guide and discover which eCommerce platform is the best for your business. WooCommerce is free WordPress eCommerce plugin, a perfect match for online retailers who are willing to build their online store on the basis of their current WordPress blog or website. WooCommerce is open­source solution that is highly flexible. Its code is free for you to view, modify and contribute. 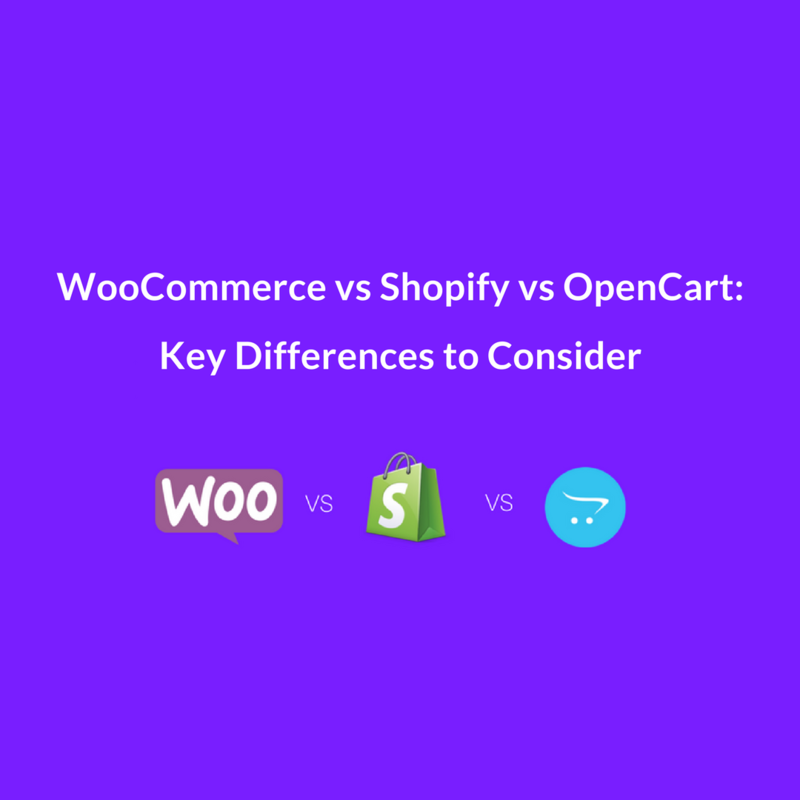 Therefore, the question ultimately comes down to OpenCart vs WordPress vs Shopify as in order to have WooCommerce, you need to first start using WordPress. Shopify is a hosted shopping cart that makes launching and managing online store smooth and effortless. It is known as one of the most dynamically developing eCommerce solutions. This is a “pure” eCommerce builder that will impress you with the most enhanced eCommerce functionality currently offered by a shopping cart. Shopify is a “pure” eCommerce builder that will impress you with the most enhanced eCommerce functionality currently offered by a shopping cart. Tweet This! OpenCart is free opensource eCommerce platform based on PHP. Opencart is known for the extensive number of extensions available, and great site speed thanks to AJAX technology OpenCart stores are running on. OpenCart Multi Store feature will enable you managing your online shops from a single admin panel. Shopify is a hosted solution that helps you concentrate on managing your business as all the tech aspects (for example, with regular updating) are taken care of. Even an eCommerce newbie will find Shopify drag ­and drop interface highly user­friendly. A variety of simple tools and clear theme editing will turn online store customization into a pleasurable experience. WooCommerce might be a bit more challenging than, for example Shopify, due again to its opensource nature. Once you coped with launching WordPress website adding eCommerce plugin to it would not be challenging either. WooCommerce is much easier, if compared to other solutions with free code architecture, for instance, Magento. You will be accompanied with on boarding wizard that will help to cope with every crucial installation steps. OpenCart slogan “Simple to start. Easy to run” illustrates one of the most considerable advantages this eCommerce solution offers. OpenCart suggests its users the highly intuitive and well designed interface. It is slightly more difficult to deal with than WooCommerce, yet even with basic tech knowledge, you will cope with the task of customizing your website with ease. This is the aspect where OpenCart will come as a winner ­ it is one of the most affordable shopping carts that will be a perfect match for startups and companies with a limited budget. Of course, there are 13,000+ OpenCart extensions available on its marketplace, both paid and free. You will have to spend some of your resources here once any enhanced additional functions are necessary. WooCommerce is a happy medium in the opposition WooCommerce vs Shopify vs OpenCart. WooCommerce is free WordPress eCommerce plugin with free updates. Understandably, you will not be able to get full advantage of it unless you spend extra on a couple of paid WooCommerce plugins. And this is where your money might go with WooCommerce. This is a beneficial option as you might add the necessary functionality as your business grows and your requests are changing. After 14 days free trial, Shopify will offer you three plans to choose from. The prices start from $29/month for basic subscription. Great Shopify advantage ­- regardless of what plan you choose you will be able to the sell unlimited amount of products and enjoy advanced eCommerce functionality ­- Facebook/Pinterest/Twitter Buy Button, for example. One more aspect to note while choosing Shopify, if you are willing to use external payment gateways (PayPal, Amazon payments, etc.) you’ll be charged 2% of the transaction within the basic plan and 0,5% in Advanced Shopify. The important issue to consider, agree? In terms of SEO, OpenCart vs WordPress might be an apples and oranges kind of comparison as WordPress is originally built as a blogging platform that has to prioritise SEO capabilities whereas OpenCart is developed to serve eCommerce businesses in general. Having said that, you should also consider the fact that free ­to use OpenCart will guarantee you basic SEO features a high end eCommerce solution should have. In OpenCart, you will still be able to assign meta keywords and descriptions to all the product and category pages. Installing additional SEO plugins would be a reasonable solution to boost your OpenCart store search engines positions. In terms of customer Support, Shopify is a real leader. Shopify Help Center offers professional assistance 24/7. Besides vast Shopify documentation, there is a wide range of video tutorials and webinars available. eCommerce University and Shopify forums will help you find the necessary answers. You can also ask forum members to provide feedback on your store and receive valuable advice. Due to plugin’s open system architecture, WooCommerce offers more limited opportunities regrading support if compared to Shopify. All because the nature of opensource and hosted eCommerce solutions are different. Woo enables you full access to you shopping cart source code. Thus, you have all the abilities to fix the issues by yourself and appeal to great materials available at WordPress forums. Once you face more complicated issue you can submit WooCommerce support ticket. As for Opencart, both free and dedicated support are offered. OpenCart community is very active. You have all the chances to find the required information by yourself. Selecting Opencart Dedicated Support variant, you’ll be charged either for help package (the price for one­time fix starts at 99$) or monthly support plan (starting from 99$/month). As an online retailer, you need to start blogging about your business now or else you’ll risk a good amount of organic traffic to your eCommerce website. In terms of blogging, OpenCart vs WordPress vs Shopify pops up as the main comparison question. WordPress is obviously the “ultimate blogging platform” whereas OpenCart offers many blogging plugins that an eCommerce writer might use. On the other side, Shopify has a built-in blogging functionality through which you can offer a blog for your users. WooCommerce vs Shopify vs OpenCart – Selecting the right shopping cart that will suit your business requirements is indeed a daunting task. There are many aspects to consider, hundreds of reviews and forum commentaries to read and evaluate. And what’s the outcome? What suits others might not work for you. You’ll never know until you try using a particular cart for YOUR business. One more aspect. Changing shopping cart nowadays is a natural process any company eventually faces. The eCommerce solution that was the greatest and most promising at some point will become the primary obstacle that prevent your business from growing. Once you feel that the changes are inevitable and you have to boost your business either to stop recession or promote growth ­ go for automated data switch. You’ll enjoy the consequences of such decision quite soon. Who will help you here? IT technologies enable processing of huge amounts of information and IT solution will help you perform eCommerce data migration from one shopping cart to another smoothly, avoiding data loss and duplication. Cart2Cart automated migration service has vast experience in performing data import and has over 100,000 migrations on it count. Data transfer from 80+ shopping carts is supported. Free Demo is offered to explore the service in action. Concerning WooCommerce vs Shopify vs OpenCart opposition, you can perform test switch to check how your current shop on a new robust shop will look like. This will help you to make your decision on your target platform reasonable. The four aspects we’ve analyzed will reshape your understanding of what benefits each platform has to offer regarding usability, pricing, SEO functionality and support. So, WooCommerce vs Shopify vs OpenCart, which one should you go with? Being one of the most easy ­to ­use solutions, OpenCart is targeted mostly at newcomers, yet it has all the necessary eCommerce functionality a business of any size will benefit from. WooCommerce is one of the most respected eCommerce solutions and has perfect reputation. Its advanced eCommerce features include adding numerous product types, advanced delivery settings, automatic tax control, stock tracking, an impressive list of payment gateways available. Though might look a bit costly at the first sight, Shopify will give you the functionality that will be worth each penny you spend on it. If your company needs a robust cart for selling online ­ Shopify should become your business ally. The best part in this situation is that you can try how your web-store content will look on one of these shopping carts without affecting your current store performance. Interested? Sign up for Cart2Cart Free Demo. Guest author Iryna is an eСommerce enthusiast, moderator of Cart2Cart blog, certified International relations manager, bookworm and keen art lover.